In a little more than a week, three young birds that hatched at Oregon Zoo will be released at Arizona's Vermilion Cliffs National Monument. The three -- Tatoosh, Ursa and Wiley -- will begin living in the wild on March 15. A cohort, Meriweather, will join them later. The condors lived at The Peregrine Fund's World Center for Birds of Prey in Boise, Idaho, after hatching at Oregon Zoo in 2005 and 2006. 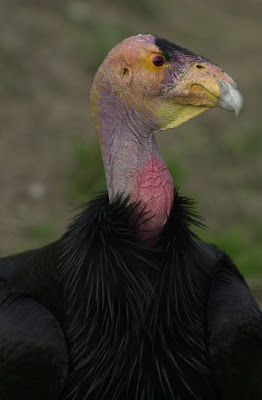 The California Condor Recovery Program involves various agencies, such as U.S. Fish & Wildlife Service, and three zoos working toward a captive population, a wild population in California and a wild population in Arizona. I would love to see such a bird one day. Make sure to watch my recent condor movie here. 11 condors, including mating!